Direct2Drive and other digital distributors refuse to sell Call of Duty: Modern Warfare 2 citing the need to install Steamworks as why. 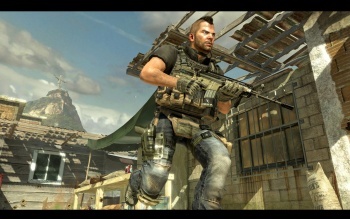 The boycott is directed at Infinity Ward's decision to use Valve's Steamworks to authenticate and update Modern Warfare 2. Steam, as a digital delivery system, is in direct competition with Direct2Drive and selling the game would essentially be endorsing their competitor. Direct2Drive seems to have led a revolt against Steam, as VE3D confirms that both Gamersgate and Impulse have embargoed MW2 for the exact same reasons. At Direct2Drive, we believe strongly that when you buy a game from us, you shouldn't be forced to install and run a 3rd party software client to be able to play the game you purchased. Because COD MW 2 requires you, the consumer, to do that, we aren't able to offer the game via Direct2Drive at this time. It's a bold move to refuse to sell what many predict is going to be the biggest game of the holiday season and what Activision itself touts as the "biggest entertainment launch of all time." Just like shooting yourself in the foot is a bold move. But in a show of class, and to show Activision that it's still on board with selling their other games, Direct2Drive is offering a coupon for $5 off any other Activision title until November 30th. So if you had your heart set on buying MW2 through Direct2Drive, at least you got that going for you now, which is nice.